You should see the tassel ya get with three of 'em! Sling swing alert! Just got through watching this week's Gay USA telecast and was surprised (and delighted) that Ann Northrop and Andy Humm made mention of and plugged the upcoming conference...and posted the web-site address for those who wanted more information. I sent them an email and thanked them and gave them the list of workshops currently planned, just in case they care to plug it again on next week's show. Hi Burner. 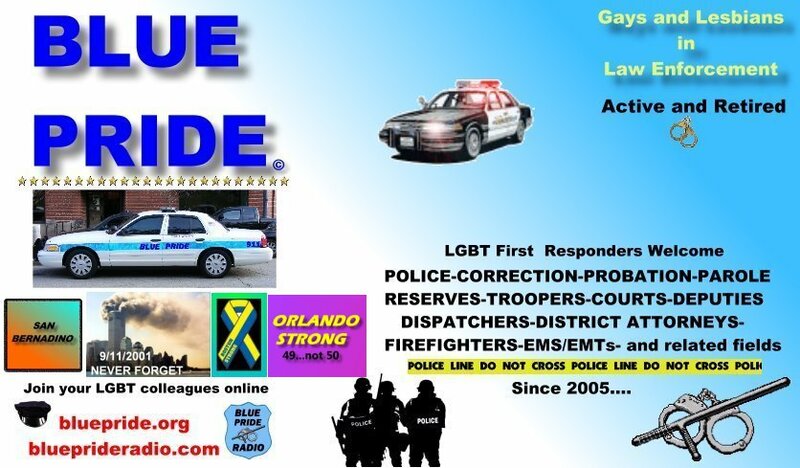 Gay USA contacted us here at Florida LEGAL and wanted to know our oppinions regarding Sheriff Babeau. After we told them what we thought about him, we gave them the information on the conference. Andy Humm and I go back a long way. I was a guest on their show, while Lou Maletta was their host, talking about gays in prison. While I was on Rikers Island, I invited Ann Northrop to come out and advise me on programs for LGBT inmates. She came out and gave me some great information that the Department of Correction uses to this day. Ann and Andy are great people who run a quality show. Hi Prydeguys.... Andy told me that they had been contacted by someone in FL, which is how they got the information about the conference. He didn't say it was you. Discretion is his middle name and I'm not sure if he knows we know each other. Be that as it may... Andy said he would make another mention of the conference on next week's show, based on the info I provided. I share your opinion of both Ann and Andy. Good people who have done much more for the community, consistently and over such a long period of time, than most anyone I know....except you! Which is not to say they don't, at times, have me pulling my hair out when there occurs a confrontation between the gay community and the police. Knee-jerk reaction, especially by Ann, is the blame the cops. Oh well. I've had this dream about them, and their receiving honors at a GOAL dinner where I'd introduce Ann as "A woman who most of you in this room know by reputation....and who the rest of you have probably arrested at one time or another in your career!" Throughout the years when I was active in GOAL I would, whenever I learned of something with a joint connection to the gay and law enforcement communities (that wasn't confidential), contact one or the other and feed them something to report. I figured the more POSTIVE news they could share regarding law enforcement, the better. I continue to do that and, over the years, while I've yet to meet either one, I built up a good rapport with both of them. In NEW YORK "Gay USA" is seen in Manhattan on MNN on Thursdays at 11 PM on Time-Warner 34, RCN 82 and FiOS 33 and simulcast at www.MNN.org channel 34/82. PHILADELPHIA AREA: MiND TV (35.1) Saturdays at 7 PM NATIONALLY: "Gay USA" is distributed nationally on the Dish Network (Ch. 9415) through Free Speech TV. Click on schedule. Hi Burner. Actually, Andy Humm spoke to our president Michael Barron and not me. Michael then asked the board members to put together indvidual statements about the sheriff which he fomunated into the response to Gay USA. I'm not sure if Andy and Ann are even aware that I'm vice president of Florida LEGAL. They do know that I was president of GOAL. When you talk to them again, please send them my warmest regards. Your wish is my command. BTW, in return you can send ME a copy of the latest "LEGAL Briefs" Seems I was dropped from your mailing list and since GOAL has issued very few newsletters since I told Vivian to shove it and quit as editor (I refused to be censored), I'd really enjoy seeing some "news". Oh.... If you only knew how hard it is for me to refrain from providing an answer to that! Carroll, any new updates on the conference in Orlando. What is going on with Legal International, they never even bother to email me back. Hi Charles. I just got word that Legal International has put the Orlando conference info on it's site. I have not had a chance to look at it yet, but I'm sure it's OK. Even though I can't attend this year due to school commitments, I remain an enthusiastic supporter of Florida LEGAL and our annual Conferences. Bear, I have already included you, in the official conference book, as a Sergeant Sponsor !!! Since I'm the one putting the book together, YOU KNOW I'm going to put you where everyone can see you !!!! I'll send you a copy as soon as it comes back from the printer.